Hi Friends, It’s Hot Dog with our latest Smart Barks. It is important to be #FDNYSmart year round. But as the school year is coming to a start, here are some tips that will keep you safe and prepared! Fire Drills should be held monthly. It is important to listen to your teacher or other adults for instruction during a fire drill. An approved emergency action plan must be prominently displayed, showing two ways the children can exit during an emergency. Make sure the school or daycare has multi-purpose fire extinguishers on hand. To learn more about what to look for on a school or daycare campus, click here. STOP: running will make the fire worse. ROLL: roll back and forth and cover your face with your hands. This can help put the fire out. CALL: as soon as you can, call for help. Did you know that children cause thousands of home fires each year by playing with matches, lighters or candles? Just this summer there were several dangerous fires that injured dozens and resulted in a lot of damage to homes and residences. According to the Fire Marshals, all three blazes were caused by children playing with matches or fire. Read more about it here. Matches, candles and lighters can sometimes be found outside the home like at a playground. Remember it is never a good idea to play with these things. Fire is not a toy! If you see matches, candles or a lighter outside, the best thing to do is steer clear. If you are with a trusted adult, you can let him or her know and the grown-up can dispose of it properly. To read more fire safety tips, click here. 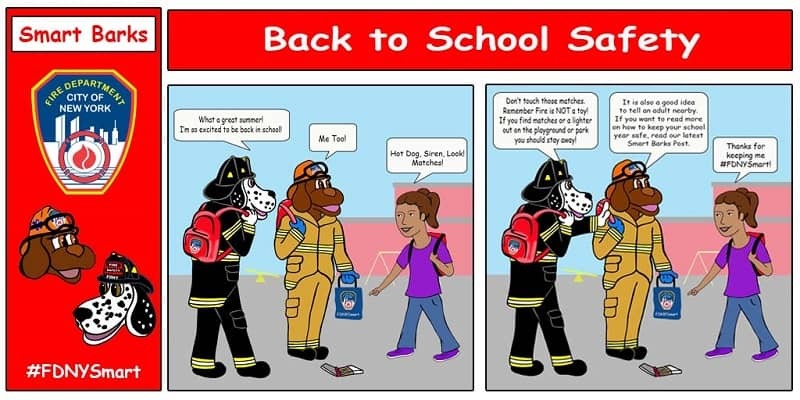 So friends remember these fire safety tips to keep your school year safe! Don’t forget to check out our Flash Facts to learn helpful and life saving tips . Plus be sure to follow us on Twitter! You can find Hot Dog and Siren here.